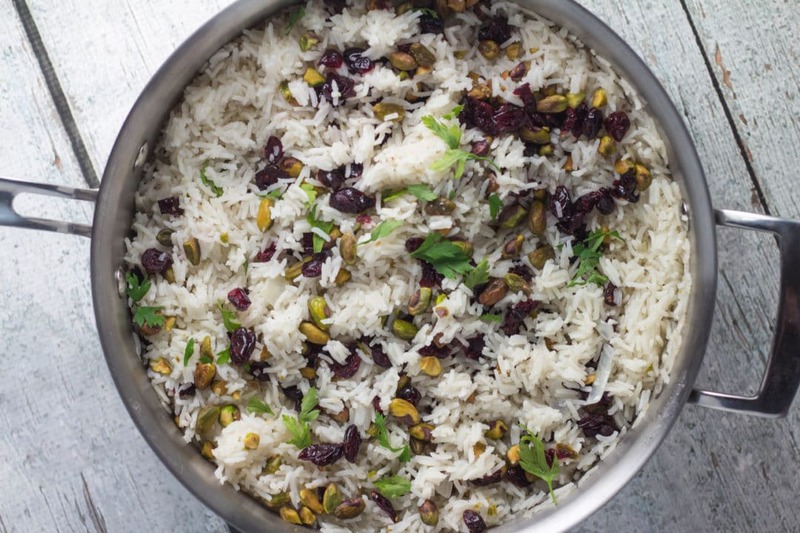 This pistachio pilaf has a perfect flavor combination with the slight sweetness from the dried cranberries and a nice crunch from the pistachios. You’ll be coming back for seconds with this recipe! Disclosure: I was not compensated for writing this post. Like most of you know by now, I am doing an Instagram Takeover this week for the Old Town Clovis Pistachio Party happening this Saturday, Sept. 30th! So far I have posted my Fall Pistachio Pumpkin Soup and 10-Minute Pistachio Pesto. 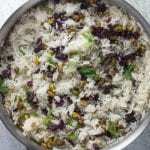 And today I am showcasing this easy, yet flavorful pistachio pilaf! You would think I would be pistachio-ed out by now…but I’m not! It is such a versatile nut you can really incorporate it into your diet in so many ways besides just snacking on them! Did you know you can obtain about as much dietary fiber from a serving of pistachios (49 nuts) as from a 1/2 cup cooked serving of broccoli? Fiber is in more forms than just fruits and veggies. Many people I talk to have a hard time packing snacks to take to work with them throughout the day…I seem to always recommend dried fruit + nuts for the fiber & protein content to keep you full and satisfied for longer periods of time. B-I-N-G-O! Try out this pistachio pilaf for one of your holiday meals coming up! What are some ways you like to include pistachios in your diet? In a medium frying pan, sauté butter, onion, shallots, and garlic together for 3-5 minutes. Add in chicken broth & seasonings and bring to a boil. Add in rice, give it a quick stir and then cover and cook for 20 minutes. Turn in the pistachios and cranberries. Taste and adjust seasonings if needed. Garnish with parsley.